Born on 9 Mar 1917 in 3 Reedley St, Burnley, Lancashire, England. He died in 1994 in Halifax. Halstead married Mary BIRKENSHAW on 11 Nov 1941. Mary was born on 23 Aug 1922. She died in 1979. 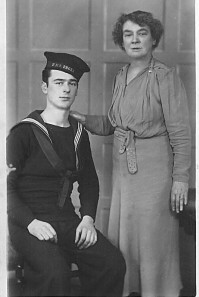 Halstead Leaver and his mum Sarah Jane Leaver (nee Pilkington) 1880-1950. Both are buried at Haggate.